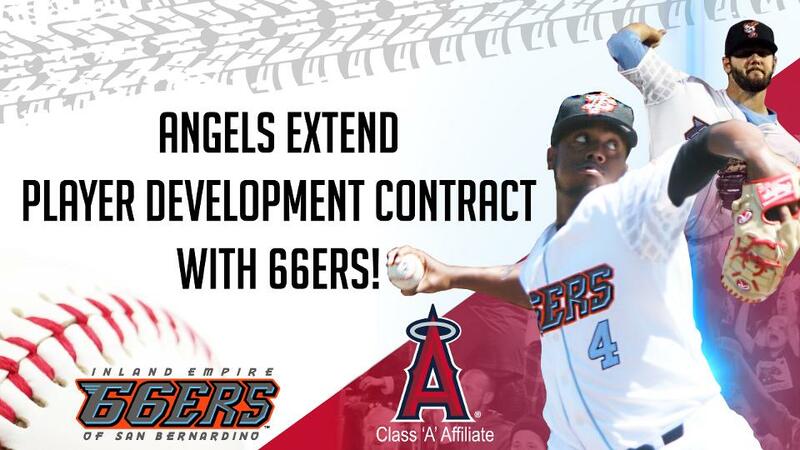 San Bernardino, CA- The Inland Empire 66ers of San Bernardino, in partnership with the Los Angeles Angels, announced on Wednesday a four-year Player Development Contract (PDC) that will extend the clubs' relationship through the 2022 campaign. The 66ers just finished their eighth season as the Angels' Advanced-A California League affiliate, a partnership that has brought a championship to the Inland Empire in 2013. As the two team's affiliation has grown over time, the natural progression of former 66ers to make it up to the Angels has increased manifold. Roughly one third of the Angels roster (both 40-man and current) is made up of former 66ers during their minor league playing days. When coupled with players that have spent time with Inland Empire on MLB injury rehab assignments, 26 players on the Angels roster (including 60-day DL) have donned a Sixers uniform. Over the course of the PDC, the Angels will become the longest tenured MLB affiliate in San Bernardino professional baseball history. "We are delighted to continue our amazing relationship with the Angels for at least four more seasons," Inland Empire General Manager Joe Hudson said. "We are so thankful to work with all the great people in the Angels front office and player development departments beginning with General Manager Billy Eppler and his entire staff. The job that he, Mike LaCassa, Mike Gallego and Chad Tracy, among many others, do is appreciated by the 66ers and our fans. The 66ers are proud that the Angels have their future ballplayers come through San Manuel Stadium. We are also very pleased the Angels feel our operation is worthy of sending big league rehabbers to us consistently, including in 2017 when we welcomed their greatest player ever in Mike Trout." "The Los Angeles Angels are excited to extend our relationship with the Inland Empire 66ers for at least the next four seasons," Angels' Director of Minor League Operations Mike LaCassa said. "This is a strong partnership and we're grateful to Dave Elmore, Joe Hudson and the rest of the 66ers staff for their continued support." Season seat memberships as well as group outing can currently be booked by calling the 66ers front office at 909-888-9922 or visiting www.66ers.com.